We design a lot of custom sheds that complement historic bungalows, but most are commonly covered with lap or novelty siding. Recently we got a chance to built a slightly differently clad shed for a unique 1940s bungalow in New Port Richey. The house, and an existing garage on the lot are both covered completely in wood shingles, so we designed the new shed accordingly. One of our customer favorites is the tropical Snack Shack that we built in Palm Harbor with combination bar and storage shed. 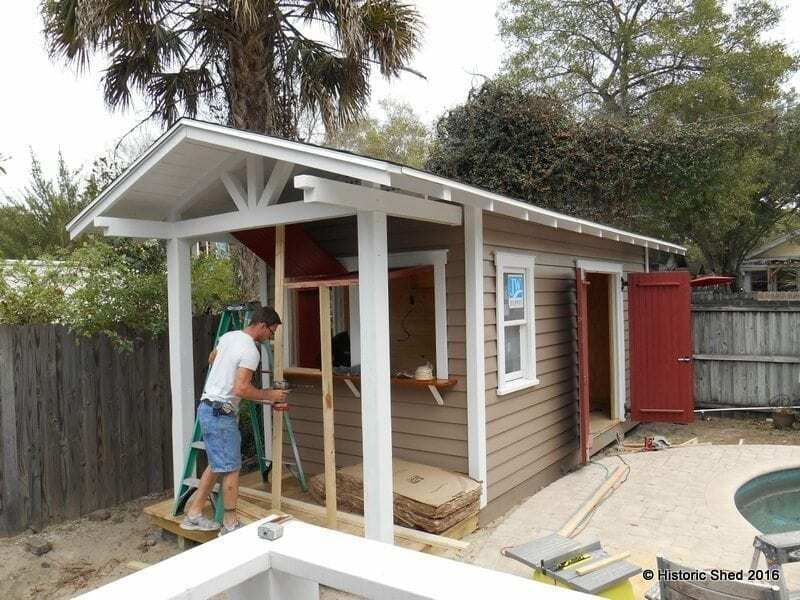 The shed design was recently adapted for a narrow site behind a historic Craftsman style home in the Old Seminole Heights Neighborhood in Tampa. The resulting shed was 8'x18' version with framing details that complemented the historic home. The shed was approved by the local historic preservation office. 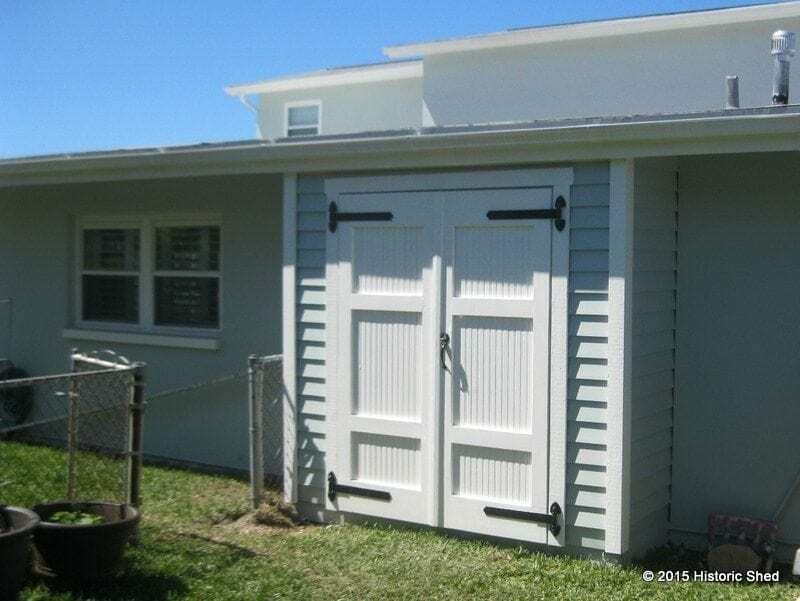 Last summer we built a shed in the historic Village of Longboat on Longboat Key, which was the talk of the neighborhood according to our customers. The home where the shed was built is the oldest building on the island, built in 1902 and was originally an Inn and Restaurant. The shed we built for them used elements of the main building, including novelty wood siding and a metal roof. It was the first one we built with a transom over the shed doors, which turned out to be a really nice architectural feature. The shed was set to the rear of the main building, along the side yard with access to the rear alley. It was set far enough from the side property line to allow storage of kayaks and other equipment, so the owners had the concrete pad extended to the side. The shed had a very steep roof, gable vent that complemented the main house, and a double set of doors that faced the rear alley. The side of the shed has a central doors flanked by two 6/1 windows. There are also flood vents since the area is located in a flood zone. About 9 months after completing the shed, we were contacted by a neighbor in Longboat Key who also lived in a historic home. His home was originally the one-room school house for the village, which had been transformed into a residence in the 1950s. He liked the neighbor's shed just the way it was, so asked for something similar, using elements that complemented his home. The Village of Longboat Key has an interesting history and is worth a walk around if you are heading to the beach in that area (which is definitely worth visiting as well). For a walking tour, see: http://www.longboatkeyhistory.com/tour-route--history.html and http://www.longboatkeyhistory.com/map--details-of-tour-route.html. As you walk around, keep an eye out for the roaming peacocks, which add a nice eccentric touch to the area. What do you do with a recessed planter at your house? Aside from growing some measly flowers, you might consider scrapping the planter and add some attractive storage. The owners' response after the shed was complete: "It looks fantastic...it's looks like it was part of the original house ... Love it!... " The side yard is often where AC units, electrical meters, and garbage cans find refuge, but you can also use the side yard for covered storage, making it useful and attractive. For people with a wide side yard, you can put in a large storage unit like this 6'x12' shed, but even those with a narrow side yard can get a nice bit of storage that looks good. Historic Shed recently completed the installation of a custom garden shed in the VM Ybor Community Garden. 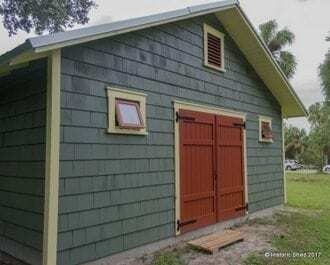 Funded by a community grant from Hillsborough County, the small shed was designed in the Ybor City architectural vernacular; the shed features a gable roof design, lap siding, metal roof and other architectural elements common in the area. Area residents will use the shed to store communal gardening tools to tend the sixteen individual plots to grow vegetables and herbs. The garden plots are available free to area residents to plant as they please. The grant requires that the community members participate in the grant project; residents will paint the shed and install the foundation tie downs. 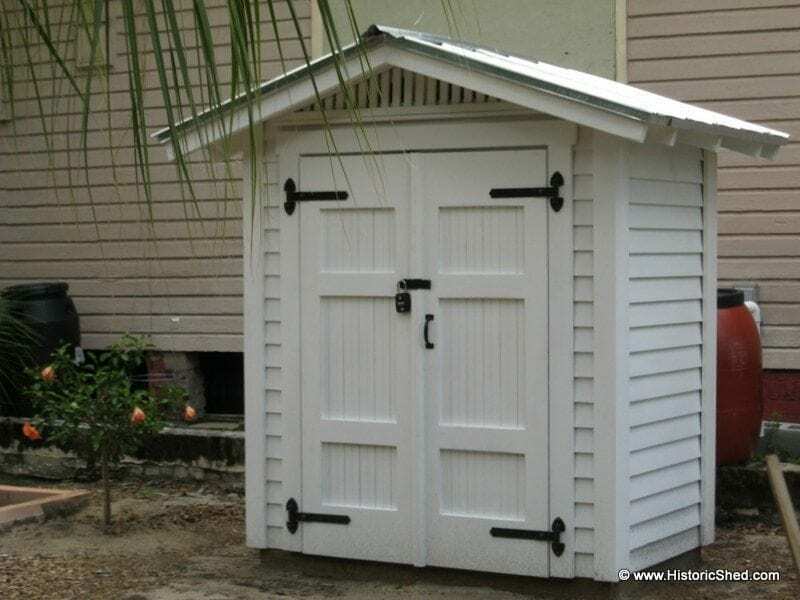 Historic Shed recently completed this 10'x14' custom garden shed to complement a 1920s residence in the Hyde Park historic neighborhood in Tampa. The storage shed features a gable roof with exposed rafter tails and eave brackets similar to the main house. We have a lot of people in love with our shed designs, but because we use high-end materials, they don't always fit into everyone's budget. So, we've spent some serious time discussing how we can create a more economical design without compromising the charm, detailing and longevity of our product. A shed with faux board and batten siding was one of our design solutions, using pressure treated plywood to simulate the board siding and then applying cypress battens for a finished look. This would reduce both material and labor costs, but when detailed properly, still looks appropriate behind historic homes. Board and batten is a traditional historic siding that originated in Norway and Sweden. It was popularized in the United States by Andrew Jackson Downing in the mid 1800s in his picturesque residential designs. The siding was commonly used in Florida for outbuildings, including barns and garages, making it an appropriate material for use on sheds in historic districts. (See a Florida property built in the 1880s with board and batten outbuildings and the shed we built to complement it.) We'd been discussing building a prototype of the board and batten economy shed for a while, but hadn't managed to find the time. Then we were contacted by a Clearwater couple who wanted an 8'x10' shed that complemented their 1920s bungalow with a stucco exterior. Since they did not need cypress lap siding to match their house, we suggested trying the board and batten shed. They jumped at the chance since the interior of their home features board and batten on their built-in cabinets and as their bath interior finish. We customized the shed to reflect elements from the main house; we installed a checkerboard gable vent, angle cut the rafter tails, and installed brackets that mimicked the ones on the main house. The end result created a very pleasing shed design that was less expensive to build, yet that maintained historic character and still uses durable materials. We are now pleased to offer the Historic Shed™ Board and Batten Shed line. We think you'll like it.